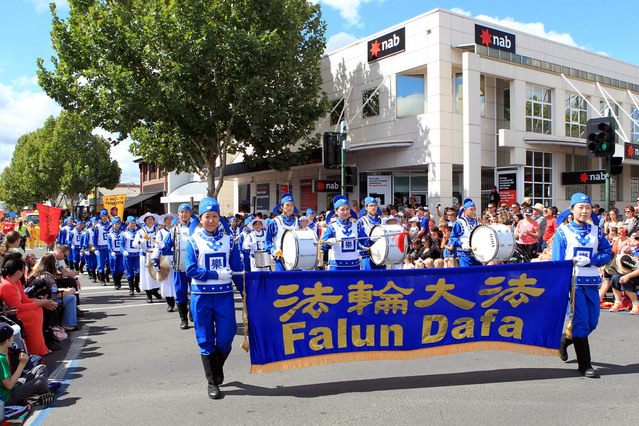 The Falun Dafa group, featuring the Divine Land Marching Band, won “Best Musical Entry” this year at the Bendigo Easter Festival Parade on March 31st. The parade is a major highlight of the three-day event that attracts over 100,000 people every year. 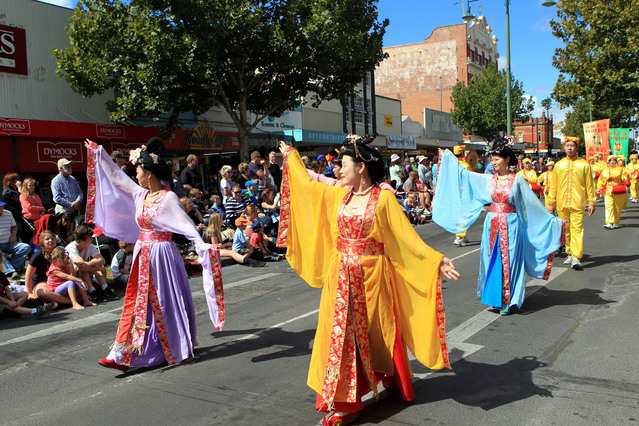 There is a large Chinese community in Bendigo. The first Chinese Buddhist temple in Bendigo was founded in 1860. 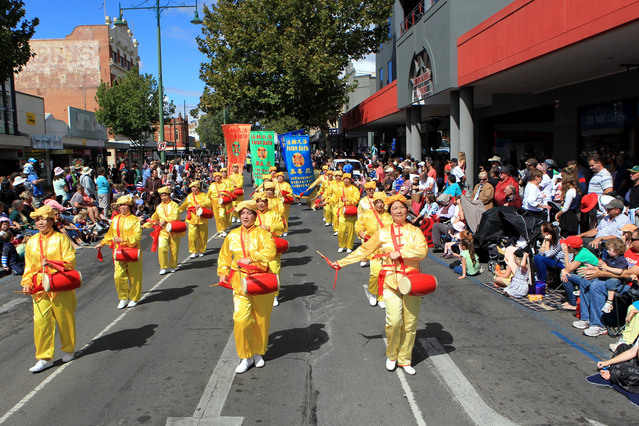 The Easter Parade in Bendigo started in 1871, and in 1879 Chinese people participated in the parade for the first time. A colorful Chinese culture display has since become a prominent feature of the parade, with a large Chinese section as the grand finale. The Divine Land Marching Band performed many lively songs in the parade. Following the band, Falun Gong practitioners demonstrated the exercises on a brightly decorated float. Traditional Chinese fan dance and waist drum performances by the Falun Dafa group were also well-received by crowd. A spectator from Melbourne, John Viaoe, was impressed by the Falun Gong entry. He said that the traditional Chinese culture manifested by the practitioners was very beautiful. “The band was excellent. They must have spent a lot of time practising. They are all volunteers and they contributed so much to the community. I really appreciate their efforts,” John said. Donovan Coedzee, visiting from South Africa, was awed by the beauty of the Falun Dafa group's presentation. “Those Chinese in traditional costumes are so beautiful. Their music was impressive too. I loved their performance,” he said. Two Taiwanese girls, Lievia and Jassie from Shepparton, a town 100 miles away, enjoyed the performances as well. “We like the band, the fan dance and waist drum. We are glad to see that Chinese culture is so popular all over the world,” Lievia said.